One of the great things about having dreams is when they come true. 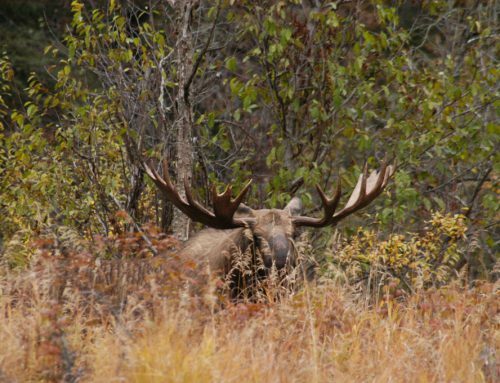 During my many many years of hunting, I have been blessed to adventure, explore and harvest almost everything on my dream list, except for a Musk Ox. Until this past spring. 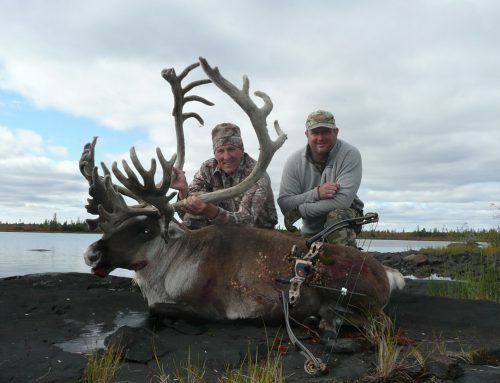 I was hunting outside of McGrath, Alaska in the fall of 2016 with my best hunting buddy and we experienced one of the most incredible adventures ever in some of the most beautiful country anywhere. Throughout our 21-day adventure we experienced almost all Alaska had to offer: rain, snow, wind, rain, wind, rain, floods and freezing cold weather, all offset by its majestic beauty. 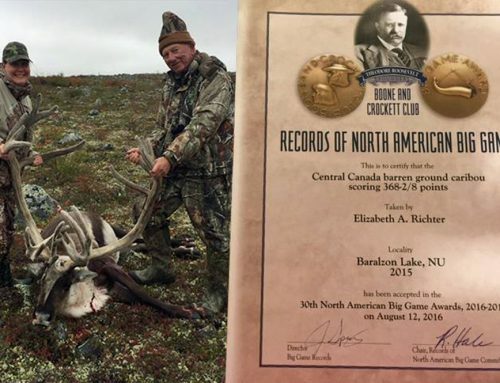 We harvested two, full curl Dall rams, two black bears (one measured 7’6”), two 400” class caribou and two huge Alaskan moose (both over 30 points and one just under 72”). To say this was an epic adventure is an understatement. The only thing that made this adventure better was making friends at that base camp with Ward and Nancy Poppenberg from Duluth, Minnesota. Fast forward to February 2017 at the SCI convention in Las Vegas where my wife, Danyel, and I ran into Ward and Nancy. It was a great event for me because my good friend and World Class Alaskan outfitter, Bob “The Legend” Cusack, was there displaying the incredible Brown Bear I harvested with him in the spring of 2016 (Huntin’ Fool article November 2016), and I got to introduce Danyel, and reunite for me, with Ward and Nancy. This is where this story actually starts. The first day of the convention found me at the Webber’s Lodges & Henik Lake Adventures booth, manned by their general manager, Russ Mehling. 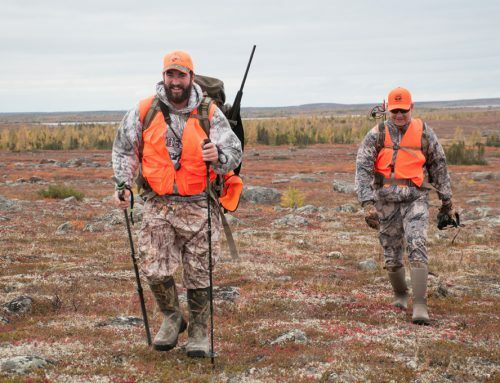 Russ is a fantastic representative for these first-class outfitters, a true outdoor enthusiast. 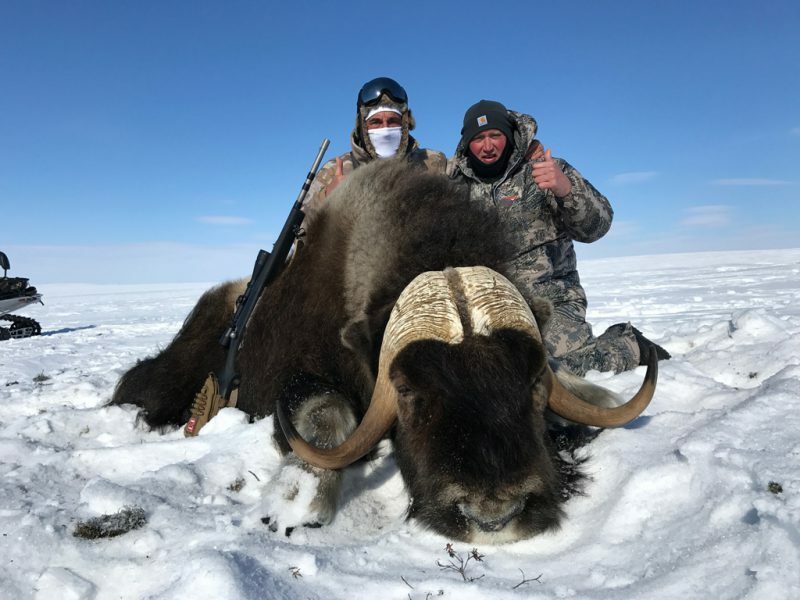 While speaking with Russ he mentioned that he had just had two last-minute cancellations for their spring Musk Ox hunts I immediately started contacting hunting buddies but could not find one person who wanted to share in this dream hunt of mine. I even offered to pay (for the trip) to offset the realities of very cold harsh weather and multi-leg flights to get to our hunting destination. 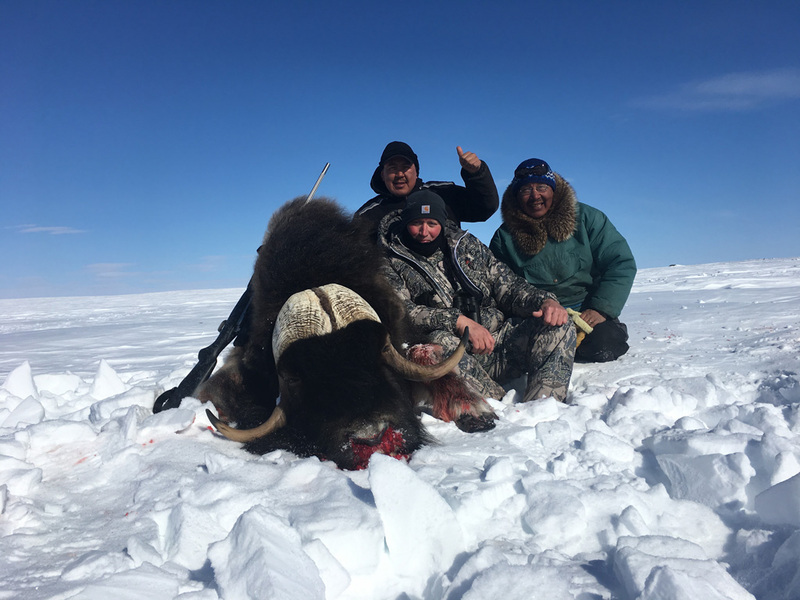 Later that night while trying to figure out how to make this dream come true, I received a call from Ward who asked, “Do you have any interest in a Musk Ox hunt?” I almost fell off my chair! 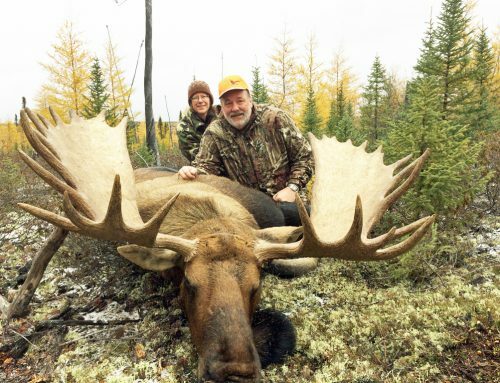 He went on to tell me he’d always wanted to harvest a Musk Ox and earlier that day he had met a first-class outfitter named Russ Mehling. I knew it must be fate. The next morning Ward, Nancy, Danyel and I met at the SCI entrance and rushed to the Webber’s Lodges booth where we snatched up those two Musk Ox hunts. Russ was quick to point out that this adventure was in two months, required gear rated at -50 degrees (or better) and required multiple flights, which could easily be delayed because of weather. That push away sealed the deal for Ward and I. I think Danyel was extremely happy not to be roped into this adventure with me. The time flew by as my Amazon Prime account heated up with purchases to protect me from the extreme weather we were sure to face. Gloves, fur lined headgear, thermals and boots rated at -50 degrees and colder were shipped and received. Monday, April 17, started with a quick flight from my home of Steamboat Springs, Colorado to Denver, which was followed by a flight to Winnipeg, Manitoba where I met up with Ward, who had flown in from Duluth, Minnesota. Ward and I exchanged stories on how quick this dream was coming true and how great our wives were for allowing us to be who we are. 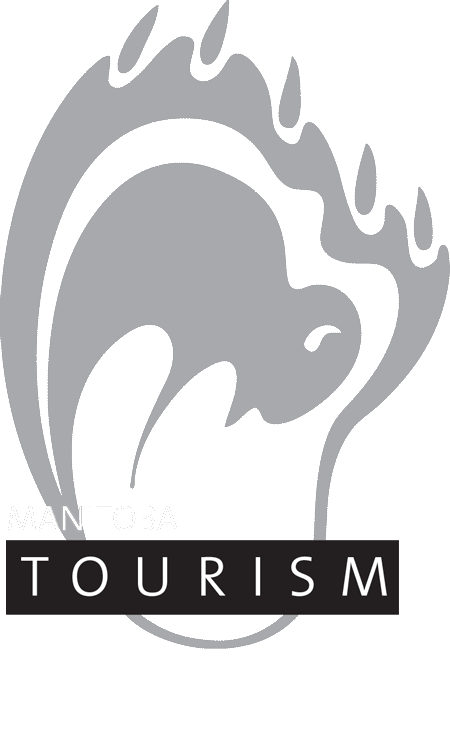 This is where the Webber’s Lodges crew took over, starting with a very nice room at the Grand Hotel located at the Winnipeg Airport. The second day of travel took us from Winnipeg to Churchill, on to Rankin Inlet, then Chesterfield Inlet and finally to Baker Lake, Nunavut (all arranged by Webber’s and included in the cost of our hunt). These flights were nowhere near as bad as we had been warned. Refueling stops broke it up and the air was smooth. On Tuesday, April 18 we arrived at the Baker Lake Airport and were driven to the hotel, which would serve as base camp for this adventure. The hotel was my first experience with a base camp in a hotel, which had a fantastic chef who prepared our meals and private en-suite rooms with TV. That evening we met our guides Jonathon and Donald over a phenomenal meal and discussed the coming week’s adventure. The next morning, Wednesday, April 19 was beautiful and sunny as we headed out on our (own!) snow machines. I was happy not to be a passenger, or worse yet, bouncing around in a komatik. Russ wasn’t as lucky: we ended up one snow machine short so he volunteered to be bounced around in that wooden “beat-you-to-death” sled all day. The weather was perfect with sunshine and visibility for miles. 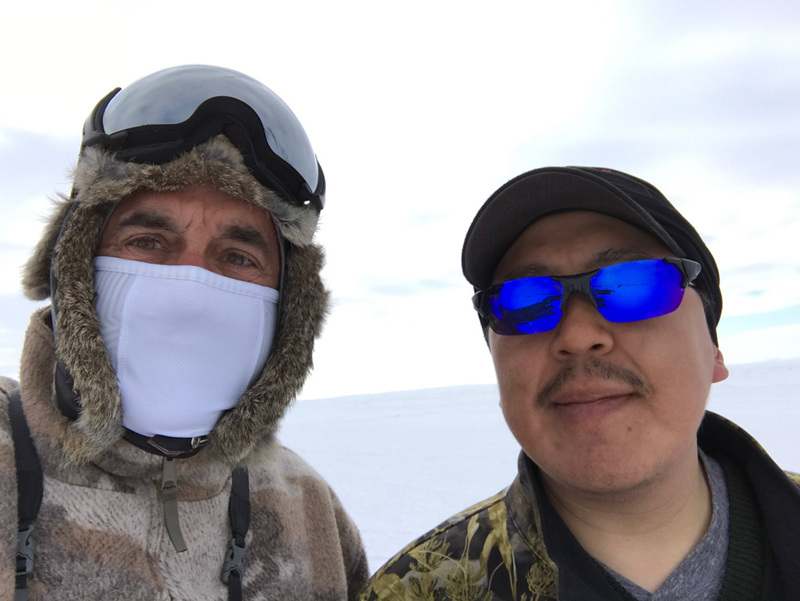 Our guides Jonathon and Donald were Inuit with extensive knowledge and eyes beyond belief. Before we even stopped for lunch, we spotted a small herd of good bulls. The third hunter in our group, Logan, won the coin toss and harvested a really good bull which green scored 105″. While pictures were being taken and congratulations were being exchanged, our guides spotted another herd with several really good bulls in it. This herd was about six to eight miles away and perfectly positioned for our ambush. The adrenaline flowed as we raced our snow machines across the frozen ground towards this herd of Musk Ox. We parked the snow machines and stalked to within 250 yards. Once we sorted out who was going to harvest what, I took my shot, followed immediately by Ward. A light press of the trigger on my trusty Ruger 375 Alaskan ignited a 270-grain Hornady expandable missile and my dream Musk Ox was mine. 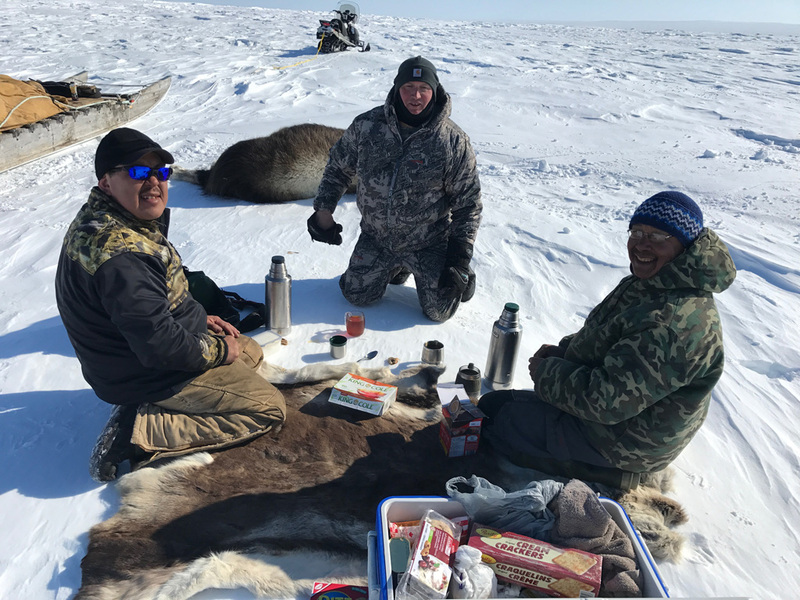 After a moment of reverence for these spectacular animals and some photos, we celebrated with hot tea and cookies, served by our guides on a caribou hide before dispatching these wooly prehistoric looking beasts. Our incredible trophies green scored 115” and 108” respectfully. My guide Jonathon cut off a piece of fresh Musk Ox meat, handed it to me and directed me to enjoy the best sushi on earth. It was remarkable! We then boned out and bagged all the meat, wrapped the capes and repacked the komatiks for our long journey back to base camp where a warm meal and a hot shower awaited us. We logged over 75 miles on snow machines that day and all the while, Russ bounced around in a komatik. Good thing he’s tough! The next day, Thursday, April 20, Ward and I walked the entire town of Baker Lake in about 30 minutes, returned to the hotel, had a good lunch and planned our departure. As always, the moment I’m done with one adventure I start planning my exit. It seems like I’m always planning an adventure and once its done I’m always trying to get home. I guess we’re always trying to get home. As luck would have it, the excellent staff at Webber’s Lodges were able to arrange for our extract that afternoon. That night found us back at the Grand Hotel in Winnipeg enjoying drinks and some really good pizza. I returned home to my ranch in Steamboat Springs the next day, much to the surprise of my fantastic wife, with the stories of my dream Musk Ox adventure. Every day of my blessed life has been an adventure. This life is so precious and so fantastic I can only hope everyone is counting their blessings daily, being who they were meant to be and living life to its fullest.